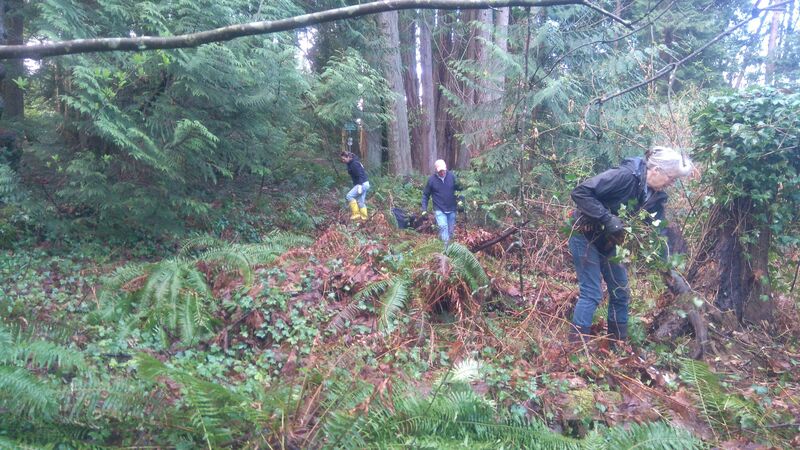 Friends of North Saanich Parks plan events to remove invasive plants out of the parks in North Saanich. We are happy to organize an event if you have a group that you would like to work with. We are always adding more events, so check back often to see if there is an event that works with your schedule. Everyone is welcome!!! The more the merrier!!! This event is in Quarry Park in North Saanich and we are very excited to be working with the Greater Victoria Green Team!!! Quarry Park is on East Saanich Road. Parking is limited at the front of the park, extra parking is on Leal Road which is the side street close to Quarry Park. We will have snacks and refreshments provided by the Greater Victoria Green Team! We ask everyone to bring gloves and clippers if you have them. We have extras if you don't have your own. We recommend wearing long sleeve shirts, long pants and good boots. Dress for the weather. Bring all your friends!!! Everyone is welcome, training will be provided. Invasive plant removal will be in Denham Till Park on the Clayton Road side of the park (the forested area). Parking on Clayton Road beside park. There will be lunch and refreshments! Everyone is welcome! Training is provided. Refreshments and lunch are provided! This event is in Lillian Hoffar Park in North Saanich and we are very excited to be working with the Greater Victoria Green Team! Lillian Hoffar Park is on McDonald Park Road north of the North Saanich Middle School. Parking is limited. Extra parking is on McDonald Park Road south of the park. We are excited to be working with the Sidney North Saanich Yacht Club (SNSYC) for this event! We all have been working on this park for several events and the results are remarkable. Nymph Point Park is on Marine Way. Parking is available in the Sidney North Saanich Yacht Club parking lot. Refreshments and lunch are provided. We ask everyone to bring gloves, clippers and/or shovels but we do have extras if you don't have your own. This park is full of Daphne which can be an irritant to the skin. We recommend wearing long sleeve shirts, long pants and good boots. Bring all your friends!!! Everyone is welcome, training is provided! This was a wonderful day with a great turnout of volunteers. We want to thank everyone for all their hard work. 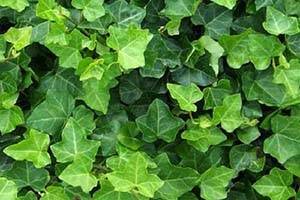 There was abundant English Ivy, Daphne and Laurel removed. R.O. Bull Park is on Wain Road in North Saanich. It contains one of the few stands of old growth Douglas fir and Western Red Cedar in North Saanich. This park was donated by Mrs. Ruth Bull in 1973 in honor of her husband, Colonel Roland O. Bull. In just 11 months, we held 14 work parties and have spent more than 278 hours removing invasive plants out of this park. On Jan 29, 2018 we completed removing all the invasive plants from R.O. Bull Park!!! Due to the invasive plants ability for regrowth and seed dispersal, we can never be completely finished a park. 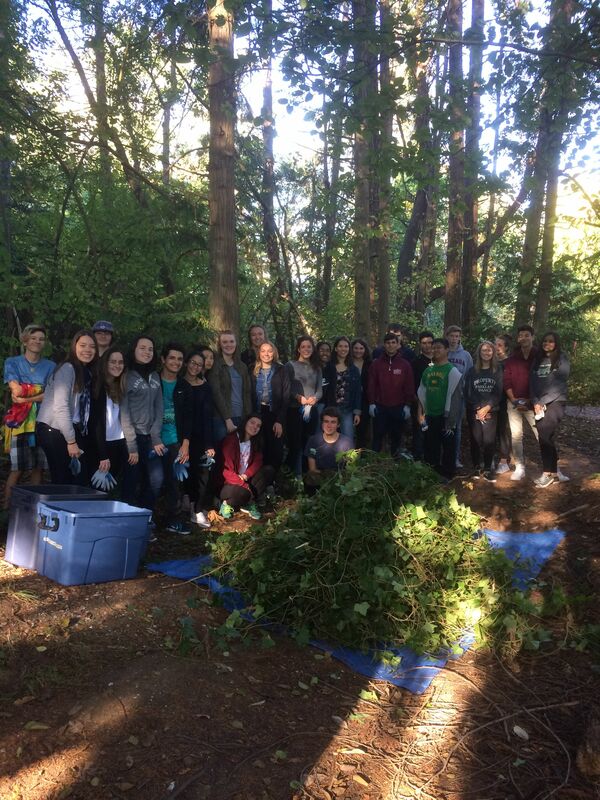 We use the term "complete" to describe the first complete removal of invasive plants from the park. However, the battle is far from over. We are very fortunate to have found stewards for this park. They will continue removing any invasive plants that grow in the future. 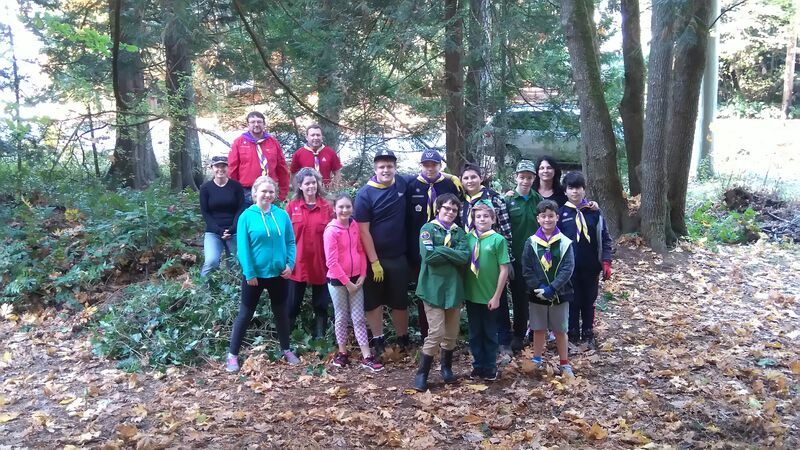 We had the pleasure of working with the 10th Tsartlip Scouts group twice in Quarry Park. We had a great time and we removed a lot of English Ivy. The areas that have had the ivy removed are looking great!! Thank you to the 10th Tsartlip Scouts for all your hard work!!! During 2017 we had three classes from Deep Cove Elementary working in Denham Till Park removing ivy. 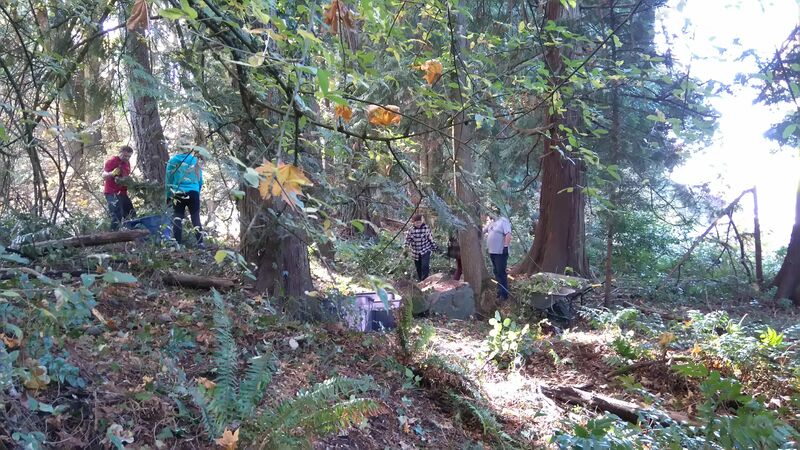 We also had Parklands High School and North Saanich Middle School students removing ivy in Lillian Hoffar Park. We will be having more student work parties in 2018 in both Denham Till Park and Lillian Hoffar Park. 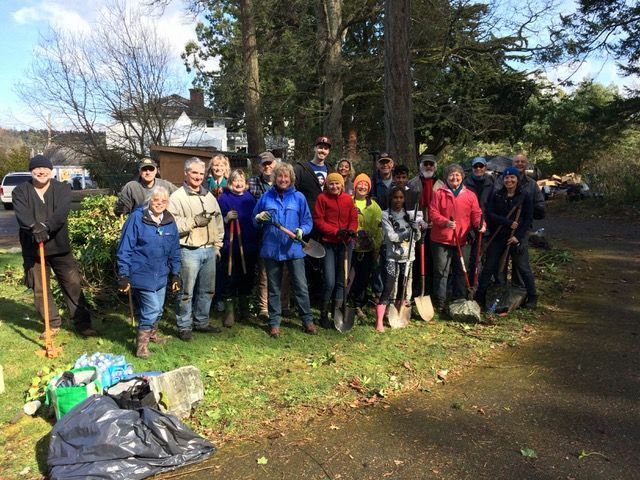 Thanks to the Sidney North Saanich Yacht Club, we tackled a huge portion of Nymph Point Park! We have taken out 3 dumptruck loads of daphne in just 2 work parties. We will continue our efforts until the park is back to its natural ecosystem.